@Echo 7-7 @Xoria @Garuda @LordVipex @Blodo @aerelm @Haste @Treewyrm @Jinx and @Alley , are happy to share with you the changelog of Discovery Freelancer 4.88.00. You will notice the changelog is pretty slim. It's incredibly hard to remember all the little things that have been done as they were not completely kept track of under the previous development system so we have listed them all under "various". You will also notice the Omicrons update isn't listed here. That's because just like the Rheinland modifications, they will be released shortly after via our new patcher. The main objective of this update is to complete our migration to the new development and release system, which we cannot do until we finally push out this update. The patch will hit the server this week, unless something really really horrible happens. At any rate, here's the changelog for the initial update. 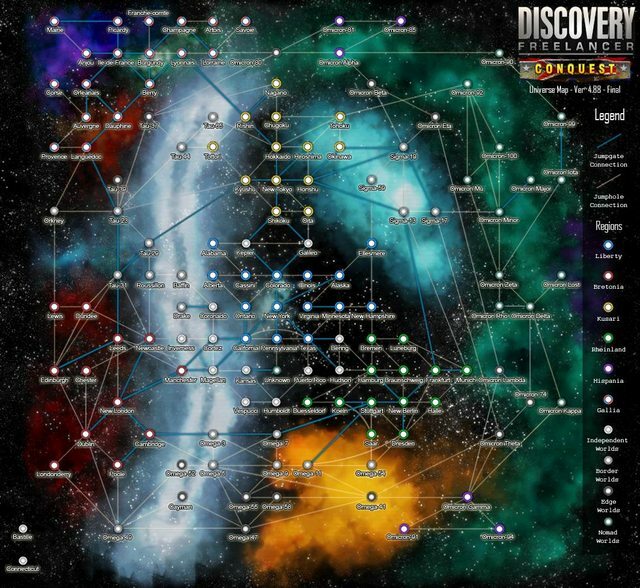 - Added DSLauncher, our new Launcher specifically crafted for Discovery. A subforum has been created under the Help & Support section of the forums to provide assistance related to its usage. - Added Adoxa's zone plugin. - Fighter NPCs have been toned down. They are now all stuck with a 2.00 fire rate. They also cannot use Mines and Missiles anymore. - Capitals will be toned down at a later point. - Preparations for Hyperspace Beacons. - Mining Machinery icon replaced due to copyright issues. Thanks to whoever thought it was a brilliant idea. - Corsair Battleship NPCs will no longer use the Osiris and instead use their own tech. - Client-side mining config updated with revised drop rate modifiers for all factions. - Lots and lots of various little tweaks. - CODENAME weapons now use a unique weapon type that deals 90% damage to Graviton, Molecular and Positron shields. - DULZIAN, PHOENIX, SOLARIS and Nomad Prototype Gun have seen their energy usage revised. - Firestalker and Sidewinder (fighter) missiles now have the same tracking they used to have in Discovery 4.86. This is, most likely, a temporary adjustment until a better way to balance them is found. - Cannonball and Catapult missiles have been redesigned and are now both dumbfire missiles. - Persephone reverted to 4.85.3 model. - Sunburst replaced with @Swallow 's model. - Added @aerelm 's unique ship, Obsidian. - Arbeiter VHF has been rebalanced. - Centurion VHF has been rebalanced. - Greyhound VHF has been rebalanced. - Sabre VHF has been rebalanced. - Sichel VHF has been rebalanced. - Nomad Assassin VHF has been tweaked. - Blossom HF has been tweaked. - Chimaera HF has been tweaked. - Katana HF has been tweaked. - Kusari Capitals have seen their LODs range fixed. - Heavy Fighter & Very Heavy Fighter hitboxes have been reviewed and tweaked. - Cloaks now use ammo instead of commodities. It can be found on any base. - Nomad cloaks now also use ammo. - Scanners have received range adjustments. - Fixed reputation requirement to buy generic civilian guns. - Pilots and Credit Cards have returned. - Salisbury has been culled. - Fukuoka has been culled. - Oita: transferred Osumi Base. - Hiroshima: transferred Renzu Shipyard, revised layout, added Jump Gate to New Tokyo. - Ellesmere: revised Jump Hole connections. Omicron Minor connected to Sigma-17. - Londonderry has received significant changes and has been de-guarded. - Chester has received significant changes related to atmosphere and layout. - Bethlehem Station, Pennsylvania will now be home to Liberty Lawful NPC spawns. - Added a Jump Gate between Ontario and Alberta. - Added a Jump Gate between Texas and Minnesota. - Shortened/revised path between Omicron Alpha and Omicron Gamma through the Hispanic Omicrons. @Durandal has also been hard at work to provide an updated map of Sirius. This map does not contain the changes of the Omicrons update. Kudos to him! - Cannonball detonation range reduced to 14 meters from 20 meters. - Introduction of the MK3 Cloak for transports. It can now be built on POBs. Transports with more than 2200 cargo space cannot use the MK2 Advanced anymore. Battleships and Cruisers can still use the MK2 Advanced and are recommended to do so. - The cloak consumption rates are as follow for the time being: 8/s Light Batteries for MK1, 4/s Light Batteries for MK2, 2/s Light Batteries for MK2 Advanced, 1/s Heavy Batteries for MK3. - Nomad Cloaks require Nomad Cloak Batteries. The consumption rate is 1/s Nomad Battery. The K'Hara player faction ID still allows permacloaking for the time being. - Wild Cloaks are unaffected. - Kills FLCompanion and FLStat on start to prevent patching crash due to locked files. Gives an option to kill Freelancer.exe as well. - Cloak consumption rates for MK2 Advanced and MK3 reduced to 1/s. - Added two test sounds. - Rebalanced Catapult and Cannonball. - Screamer mine has been rebalanced. - Garvagh Mining Complex has been returned to the Mollys after a short invasion. - Jumpholes connecting Tau-44 and Tau-37 are now properly labeled. - Ku15_01_base now has a shipdealer room to sell the ships they've been hoarding. - Hiroshima Weapon Platforms have been switched to ku_n_grp IFF. Destroyers are yet unaffected. - The Maltese Nation has reduced the purchase price of Premium Scrap as Valetta is on the verge of exploding. Premium Scrap will now be bought for 8000/u. - The Corsairs have less interest in Premium Scrap for the moment. Premium Scrap will now be bought for 9999/u. - The Gallic Royal Navy has grown extremely interested in Premium Scrap in order to reduce costs. Maintenon Shipyard in Orleanais will now buy Premium Scrap for 14000/u. - Yarrrrrrr! The Xenos are back in town. They want to upgrade their duct tape to premium duct tape. They can now mine Premium Scrap at a 2.5x multiplier and Refugio Base in Alabama will buy Premium Scrap for 9000/u. Only a real Xeno will be able to sell his scrap to Refugio. - Yokohama will now buy Premium Scrap for 9000/u instead of 7500/u. - ALG has been normalised regarding Premium Scrap. Their multiplier is now 3.0x. - Gallic Junkers have been normalised regarding Premium Scrap. Their multiplier is now 3.0x. - The Council is also interested in Premium Scrap! Chalons-en-Champagne Station in Champagne will buy Premium Scrap for 11000/u. - The GMG has grown interested in Premium Scrap. They're interested to buy it for 9000/u at Fujisawa Mining Facility. - Implemented deployable jumpgates, jumpholes and airlocks. Admin only. - Implemented 10 blank player faction iffs. They are to be modified serverside with DSAce. - Disabled missions until the new best path file is completed. - Collector: 1 forward-firing turret has been replaced with a gun mount. - Greyhound: turret slot replaced with gun slot (can mount codenames) + agility adjustment. - Wraith: Standardized shield hitbox. - Templar: Standardized shield hitbox. - Stellion: Improved agility, reduced armor. - Rebalanced the energy usage of class 7 & 8 fighter guns and class 1 & 2 fighter turrets. - Changed empathy between Unioners and Bundschuh. - Added dsy_emp_blast ALE effect. - Features a safety for people blocked by cloudflare. - Added a button to not display unofficial servers in the ingame browser (widely requested feature). - Clicking on Launch Game will now check if there's an existing Freelancer process and will propose you to kill it or not. - Tentative fix for missions. The Texas-Minnesota jumphole has been nuked as such. - Added a duplicate Criminal commodity for BHG. - Enabled vertical scaling. You can now resize the launcher up to 1000px height. See the size grip icon at the bottom right. - Disabled all 4.88.0 launchers. They will be met with an informative message asking them to download 4.88.1. - Fixed the Texas-Minnesota JH. - Barge and Corvo have been reworked into civilian vessels. - Fixes to the Persephone. - Cardamine price at Padua lowered. - Implemented Repair Guns for Repair Ships. Not fully functional yet, requires server-side adjustments for scaling support. - Implemented Cloak Disruptors, Hyperdrive Disruptors, Hyperspace Matrix and Hyperspace Beacons. Not fully functional yet, requires server-side adjustments. - Transport shields and freighter shields have seen class adjustments. Transport Shields are now Class 6, Freighter Shields are now Class 5. - Codenames now use the W_Codename01 damage type instead of W_Plasma02. - Cannonball missile fixes, they should not be frozen in space anymore. - Cloaking Batteries (including Heavy) added to Gallic bases. - Gunboat Turrets have been rebalanced. - BHG Core infocards have been updated. - Salvager and Raba have been rebalanced. Hitpoints and bot/bat count has been reduced. - Battleship Razors have been rebalanced. Damage has been doubled, energy usage has been doubled. - Disabled mining on the Golem ship. - Feanturi (dsy_unique_2) has received mobility fixes. - Preparations for May's content. - Singapore Shipyard is now a regular IMG base. - Removed missiles from NPC loadouts.